Just when you think you know what to expect from alien invasion movies, comes “Arrival” from Canadian director Denis Villeneuve. The atmospheric filmmaker has developed a reputation for delivering a certain style, as seen in “Prisoners” and “Sicario”, his last two films that made it in my year-end top ten lists, for their respective years. The same can be said for this film, which is adapted by screenwriter Eric Heisserer, from one of several collected short stories by Ted Chiang called Story of Your Life. I suspect this intriguing and surprisingly emotional film will also hold such a spot on my list for this year’s films. 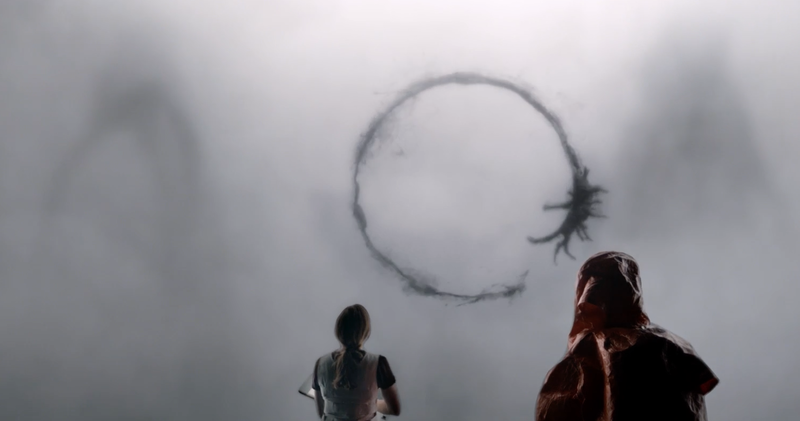 Since debuting at Telluride Film Festival in September, “Arrival” has opened wider and, as I suspected, has seen a developing word-of-mouth buzz that has kind of made it something of a winter sleeper – considering smart, thought-provoking sci-fi led by a female protagonist hasn’t isn’t necessarily commonplace (unfortunately). I’ve seen it twice now and I can’t wait to see it again. 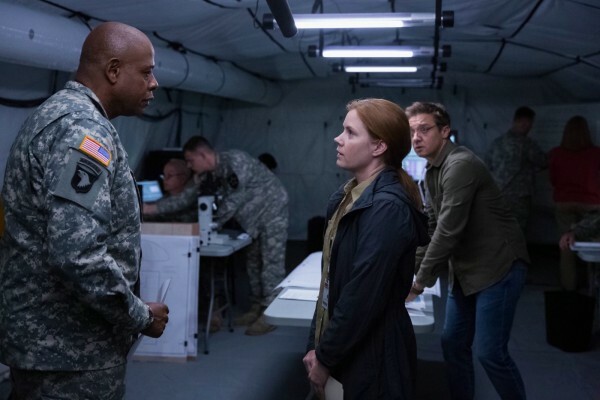 U.S. Army Colonel Weber (Forest Whitaker) shows up at the office of linguist, Louise Banks (Amy Adams), with an audiophile of alien sound clips, asking her to join his team in Montana, in order to decipher what these beings are saying and what they want. Is there a possible threat? How can a human possibly hope to comprehend the language of an alien race? 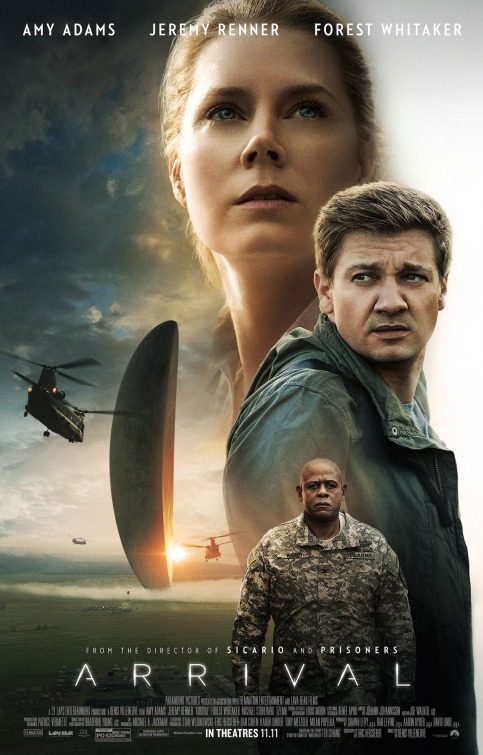 Louise takes the offer and is flown to the site, where she is partnered with theoretical physicist, Ian Donnelly (Jeremy Renner) and both of them are startled to be part of a team that’s invited inside the ship to interact with squid-like aliens, which they call “heptapods”, every eighteen hours. Their advanced language is mostly composed of ink-based designs that appear in the air near the transparent wall that separates their guests. Louise makes bold advances in their attempts at communicating to the two aliens, which Ian nicknames Abbott and Costello, yet Weber and CIA analyst Halpern (Michael Stuhlbarg) have grown impatient since no concrete answers have been given. As connection with other world leaders have become strained, tensions and fears have increased, causing Louise to probe further in her communications with this alien race before mankind does something drastic. That is the main story that you would describe to others, when talking about this film – and you will talk about “Arrival” with others. Whether it’s someone you watch the film with or someone you just know should see it. You will feel compelled to talk about it – not just because of the exquisite art direction, the unique alien designs or the hypnotic music by composer Jóhann Jóhannsson (a frequent collaborator with Villeneuve), but mostly because of the story the film tells. There is much more going on here then what has been marketed or shown in the trailer. While the story takes place in the present, by the end of the film, you may catch on that time travel, or at least knowledge of time, plays a major factor in understanding and connecting with Adams’ Louise. She makes a tough decision that may or may not fall in line with what she comes to know as the future and its one that some will understandably take issues with. I can see that, but at the same time, I get her mindset, even if I’m not sure what I myself would do. This seems vague because to reveal the decision she makes would do a disservice to you, since this is a film you really have to discover on your own. I bring it up though, to prove that this isn’t just another first contact some sci-fi flick. There is much more to connect with in “Arrival” and experience on an emotional level as well as an intellectual level and for some, that may be a turn off. So be it. “Arrival” is that rare adaptation that has me curious about the source material. I already had plenty of questions about the film’s story during my viewing experiences (yes, even the second time still conjured new ones), but once I found out it was based on a short story, I found myself wondering how different it would be from the film. Considering my fascination and pleasure with this film, I can only imagine how fulfilling the book could be. In the film, Villeneuve and cinematographer Bradford Young (who first impressed me with his work in “Pariah” and went on to lens “Selma” and is currently shooting that Young Han Solo, Star Wars movie) provide a splendid looking film, but they also focus on capturing the eccentricities of characters just as much as they are concerned with the visual discovery that occurs in the film. The sound design plays an important factor as well, realizing the unique sounds of the heptapods and the close attention to human breathing and heartbeats that are emphasized, especially considering the nervousness and anxiety once would imagine comes with meeting an alien life form for the first time. It’s the first alien encounter movie in some time that actually had me wondering how I would feel if I was experiencing what these characters are experiencing. The last science fiction movie I can recall featuring a female protagonist striving to communicate with an alien race was Robert Zemeckis’ “Contact” from 1998, which starred a determined, stubborn and vulnerable Jodie Foster. 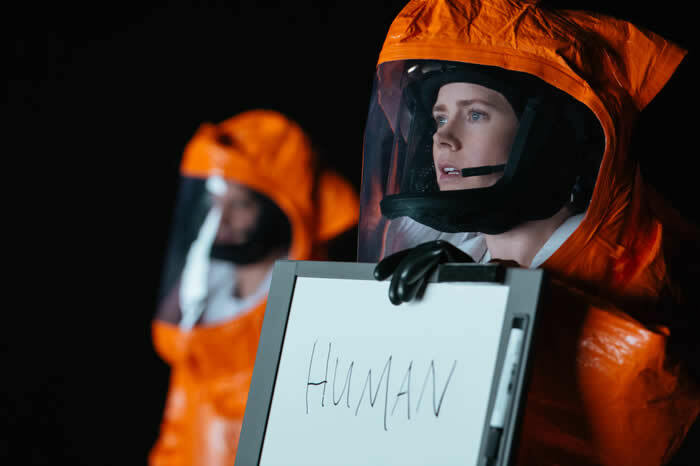 Amy Adams’ Louise reminded me of Foster’s character, only it feels like “Arrival” relies and depends quite a bit more on this linguist than Foster’s SETI doctor, although both characters are motivated and haunted by departed loved ones. Adams is great at playing characters who can jump into an unknown situation and think on their feet and as Louise she gets to play someone who is experiencing something no other human has. Sure, Renner’s Ian is alongside her as she communicates with these heptapods and the two form a bond working together, but it’s her bold ideas and resilient analysis that provides a breakthrough which enables communication with the aliens. At each moment of disbelief she continues forward, scouring information and data in hopes of putting together the pieces of a puzzle the aliens are giving mankind, before the world leaders react out of fear and confusion. This is a great role for Adams – one that will likely earn her some year-end nominations – and along with her work in the recent “Nocturnal Animals”, she’s an actress who continues to show great range. The other movie “Arrival” resembles is Robert Wise’s 1951 classic “The Day the Earth Stood Still”, since the aliens in both movies have a similar message that will impact the entire human race. The heptapod aliens in this movie do not appear in humanoid form as Michael Rennie’s Klaatu did, so there is a natural fear and trepidation in our meeting and communication with them. It’s a common response to the unknown, preconditioned by what we’ve previously seen and read and experienced. 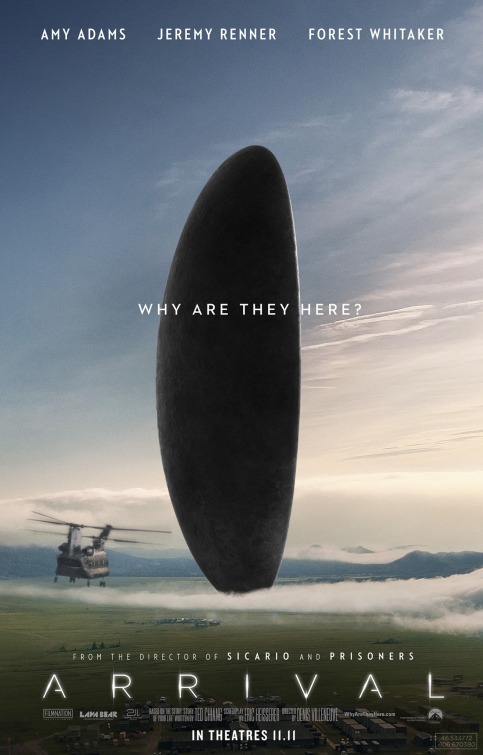 Like “Arrival”, that sci-fi classic was more of an “alien visitation”, rather than the invasion sci-fi movies audiences have been and are accustomed to. So, while it may not be entirely original, it’s nevertheless a welcome re-approach or update to the genre, requiring a renewal of audience examinations and expectations. In that sense, “Arrival” is a gem of a rarity for a modern science fiction movie. It may have the skin of a release by a major studio, but its interior is complex, full of thought-provoking, personal themes that are relatable to how we view communication, time, language and choices. It is also best to see it in a theater, if you can, to allow yourself to get lost in the scope of the motion picture. I’m purposely leaving out some key elements that take place in “Arrival”, partly because I’m still trying to figure it all out, but mostly because it should be seen and not read. Again, some viewers may take issue with the ending. I can understand that. I think one line in particular isn’t very authentic and comes out of left field, but that’s small quibbles for a film that had me pondering the existence of my own life and the decisions that I’ve made that affect the ones I dearly love.